The World Cup takes priority. On Tuesday the England soccer team played a World Cup knock-out game against Colmbia. The match went to penalties, England won and large parts of London may never recover. 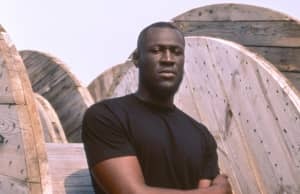 Stormzy, a big soccer fan, was performing in Ibiza as part of his #Merky festival on the Balearic island. Not wanting to miss a second of the drama, he and his audience watched the nerve-wracking penalty shootout mid-way through his performance. As soon as Eric Dier scored the decisive penalty, Stormzy celebrated with fans by performing his hit single "Big For Your Boots." You can see the chaos that ensued in the clip above. Tumbnail image courtesy of Ian Gavan/Getty.